If you haven't heard of Timberdoodle before, you are missing out! If you haven't seen their selection of games and educational toys and supplies, I recommend that you take a look soon. Our family really likes this company! Our family first discovered the Timberdoodle company a number of years ago when we first began home educating our children. We were glancing through the numerous catalogs that came with a bag of information as we attended our state's annual Christian homeschooling convention, and we noticed that Timberdoodle's line of offerings was much different than what we had normally seen in stores and online. We were both pleasantly surprised to see that Timberdoodle carries such a wide variety of curricula, books, art and school supplies, games, and toys. You will just have to check out their game selections. They are amazing! I see many games offered in this catalog that I don't see among offerings in the stores in my community. Timberdoodle recently sent me their brand new game they are selling called Solitaire Chess, to see what our family thought of it. My girls have wanted to learn more about how to play the game of chess, but I'm just not a strategy game type of person, and my husband does well with strategy, but chess is not his favorite game. 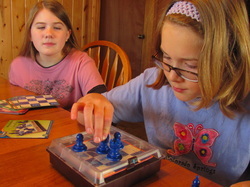 So...Solitaire Chess has already been played numerous times by our girls in our home! I really like the fact that Solitaire Chess enables the player to use up to 60 challenge cards to gain skills in the game of chess, without having to play against another player who may be far more experienced. This game can build a child's (or adult's) confidence independently, and I like that. My girls were both excited to receive this game in the mail, although we did have a bit of a difficult time removing the 30 challenge cards from the nice storage drawer in the game set. I actually needed to call Timberdoodle to ask their advice on how to remove the game cards from the drawer. The cards slid out after numerous shakes and pushing outward and downward on the cards, and once they were removed from their original packaging, we haven't had any difficulty with that since. Thankfully! 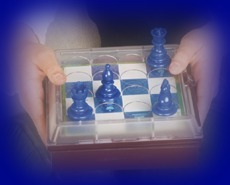 So, what did we think about Solitaire Chess? We loved it! We are enjoying playing this game, on our own, even if no one else in the family has the time right now to play a game with us. The girls are learning more about how to actually play chess, because each move that they make on the board must eliminate one of the other pieces. This is a puzzle that my girls can't resist! 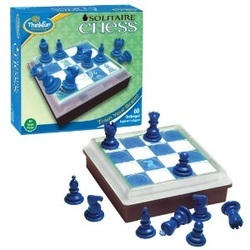 As a mom, I like the fact that everything about this game seems to be sturdy and well-designed. It is compact, and would also work well on road trips or airplane flights. We look forward to playing it over and over again, even as a part of our school hours, because it will continue to build thinking skills. I do recommend Solitaire Chess for families (or adults like me who admit that they don't do well with strategy games but would like to learn more). This would make an excellent birthday or Christmas gift for anyone from age 8 through adult. Disclosure: As a member of Timberdoodle's Blogger Review Team I received a free game of Solitaire Chess in exchange for a frank and unbiased review. No other compensation was provided.